Ethnocentrism is the tendency to look at the world primarily from the perspective of one's own ethnic culture. The concept of ethnocentrism has proven significant in the social sciences, both with respect to the issue of whether the ethnocentric bias of researchers colors the data they obtain, and the findings from research in anthropology and sociology. Such research has revealed ethnocentrism in every culture around the world, based on a number reasons, including religion, language, customs, culture, and shared history. It seems natural that people feel pride in the culture in which they have grown up and from which they have adopted their values and standards of behavior. The problem is that one may view other cultures not only as different, but also as inferior, with a great danger of behaving in ways that are damaging to those from other cultures. However, as increasing globalization brings different cultures together, people are learning to overcome their self-centered thinking and see human society from a broader, more inclusive perspective. The term ethnocentrism was coined by William Graham Sumner, a social evolutionist and professor of Political and Social Science at Yale University. He defined it as the viewpoint that "one’s own group is the center of everything," against which all other groups are judged. People often feel ethnocentric while experiencing what some call "culture shock" during a stay in a different country. Ethnocentrism, however, is distinguished from xenophobia, the fear of other strangers. Ethnocentrism often entails the belief that one's own race or ethnic group is the most important and/or that some or all aspects of its culture are superior to those of other groups. Within this ideology, individuals judge other groups in relation to their own particular ethnic group or culture, especially with concern to language, behavior, customs, and religion. These ethnic distinctions and sub-divisions serve to define each ethnicity's unique cultural identity. Anthropologists, such as Franz Boas and Bronislaw Malinowski, argued that any human science had to transcend the ethnocentrism of the scientist. Both urged anthropologists to conduct ethnographic fieldwork in order to overcome their ethnocentrism. Boas developed the principle of "cultural relativism," and Malinowski developed his functionalist approach methods of developing non-ethnocentric studies of different societies. The books The Sexual Life of Savages, by Malinowski, Patterns of Culture, by Ruth Benedict, and Coming of Age in Samoa, by Margaret Mead (two of Boas' students) are classic examples of anti-ethnocentric anthropology. In political science and public relations, not only have academics used the concept to explain nationalism, but activists and politicians have used labels like "ethnocentric" and "ethnocentrism" to criticize national and ethnic groups as being unbearably selfish—or at best, culturally biased. Other examples abound: Arnold J. Toynbee noted that Ancient Persia regarded itself as the center of the world and viewed other nations as increasingly barbaric according to their degree of distance. Traditional Chinese world maps show China in the center. England defined the world's meridians with itself on the center line, and longitude continues to be measured in degrees east or west of Greenwich, thus establishing as fact the Anglo-centric worldview. Native American tribal names often translate as some variant on "the people," whereas other tribes were often labeled with pejorative names. The Japanese word for foreigner (gaijin) can also mean "outsiders," though Japanese do not normally use the term to describe themselves when visiting other countries. It also excludes those native to the country where the speaker is located. For a Japanese tourist in New York, gaijin are not Japanese tourists or New Yorkers, but those of other nationalities visiting New York. The United States has traditionally conceived of itself as having a unique role in world history, famously characterized by President Abraham Lincoln as "the last, best hope of Earth," an outlook that came to be known as American Exceptionalism. In the United States, foreigners and even immigrants have been referred to as "aliens," and, when they did not hold legal status within the country, as "illegal aliens," terms indicating the significant difference between American-born and other people. Underlying ethnocentrism is the psychological mechanism whereby people assign higher or lower status to different cultures, with corresponding values. The ethnocentric person, when assigning status or value to various cultures, will automatically assign to their own culture the highest status or value, and therefore believe that it is intrinsically better than others. Ethnocentrism is a natural result of the observation that most people are more comfortable with, and prefer the company of, people who are like themselves, sharing similar values and behaving in similar ways. Tribal and familial groups are often seen to dominate in economic settings. Examples include the crime syndicates of Russia, Sicily, and the United States, prison gangs, and the diamond trade (Salter 2002). It is not unusual for a person to consider that whatever they believe is the most appropriate system of belief, or that however they behave is the most appropriate and natural behavior. A person who is born into a particular culture, and grows up absorbing the values and behavior of the culture, will develop patterns of thought reflecting their culture as normal. If the person then experiences other cultures that have different values and norms, that person finds that the thought patterns appropriate to their birth culture, and the meanings their birth culture attaches to behaviors, are not appropriate for the new cultures. However, it can be difficult to view the behaviors of people from a different culture from the viewpoint of that different culture rather than from one's own cultural viewpoint. The ethnocentric person will see cultures other than their birth culture as being not only different but also to some degree wrong, and therefore inferior. The ethnocentric person will resist or refuse the new meanings and new thought patterns, since they are seen as being less desirable than those of the birth culture. It is also possible for an ethnocentric person to adopt a new culture, repudiating their birth culture, considering that the adopted culture is somehow superior to the birth culture. American exceptionalism, a term coined by Alexis de Tocqueville in 1831, has historically been referred to as the perception that the United States differs qualitatively from other developed nations, because of its unique origins, national credo, historical evolution, and distinctive political and religious institutions. It refers to the belief that holding a special place in the world, the United States is therefore the hope for humanity. The term does not always imply a qualitative superiority, rather it emphasizes the uniqueness both in terms of its history and its role in the world. Believers in American Exceptionalism support its validity by stating that there are many ways that the United States clearly differs from the European world from which it emerged, as well as other countries around the globe. They argue that the United States is unique in that it was founded on a set of republican ideals, rather than on a common heritage, ethnicity, or ruling elite. In the formulation of President Abraham Lincoln in his Gettysburg Address, America is a nation "conceived in liberty, and dedicated to the proposition that all men are created equal." In this view, being American is inextricably connected with loving and defending freedom and equal opportunity. Critics argue that the United States is by no means the only country founded as a republic with such ideals, suggesting that American foreign policy has been motivated more by economic or military self-interest than an actual desire to spread these ideals. Proponents of American exceptionalism also assert that the "American spirit" or the "American identity" was created at the frontier (following Frederick Jackson Turner's "Frontier Thesis"), where rugged and untamed conditions gave birth to American national vitality. Other nations that had long frontiers, such as Russia, Canada, and Australia, did not allow individualistic pioneers to settle there, and so did not experience the same psychological and cultural impact. Among some United States citizens "American exceptionalism" has come to suggest a moral superiority of the United States to other nations. "American exceptionalism," in this sense, is merely an excuse by Americans to view the world in an ethnocentric manner. Puritan ideology had the largest influence on English colonists in the new world. The Puritan belief system was often a cross between strict predestination and a looser Protestant theology of Divine Providence. They believed that God had chosen them to lead the other nations of the earth. Puritan leader John Winthrop believed that the Puritan community of New England should serve as a model for the rest of the world. These deep Puritan values have remained a part of national identity. Following the Puritan ideology, the intellectuals of the American Revolution expressed beliefs similar to American Exceptionalism. They were the first to state that America is more than just an extension of Europe, instead it was a new land with unlimited potential and that it had outgrown its British mother country. The idea of Manifest Destiny also did much to establish American Exceptionalism. First used by Jackson Democrats in the 1840s, it put forth the idea of expanding the country from coast to coast. It was also revived in the 1890s, at the beginning of United States imperialism, to justify international expansion. The term refers to expanding the United States because of the superior moral values and ethics associated with American ideals. The idea of manifest destiny purports that it is the duty of the United States to expand the American way of life to other areas of the world that would greatly benefit from it. The United States was often seen as exceptional because of unlimited immigration policies and the vast resources of land and land incentive programs during much of the nineteenth century. Many hold the view that the country's uniqueness stems, at least in part, from those policies. Eurocentrism is a type of ethnocentrism which places emphasis on European culture and the western world at the expense of other cultures. Eurocentrism has often involved asserting that cultures not white or European as being inferior, or even denying their existence as truly human. Assumptions of European superiority started during the period of European imperialism, which began in the sixteenth century and reached its peak in the nineteenth century. During this period, Europeans explored new lands, such as Africa and the Americas, and they observed that the societies already existing in these lands were largely based on farming, hunting, and herding. The Europeans considered these societies to be primitive in comparison to their progressive, rapidly growing society. They concluded that Europe was the only place in the world that had reached the final stage of societal development. Thus, they thought of themselves as uniquely responsible for the scientific, technological, and cultural achievements that constituted the "modern world." Europe saw itself as a model for the modernization and technological advancement of the world as a whole. By the nineteenth century it was a widespread theory that European advancement had occurred because of racial superiority, which in turn provided justification for slavery and other political and economic exploitation. Throughout the era of European imperialism, Europeans colonized Australia, New Zealand, and the Americas. Eurocentric education was then provided in these areas, and the inhabitants were raised primarily with European customs. The "European miracle" theory of Europe's rise to its current economic and political position has often been criticized as Eurocentric. Cartesian maps have been designed throughout known history to center the northwestern part of Europe (most notably Great Britain) in the map. The regional names around the world are named in honor of European travelers and are oriented from a Eurocentric worldview. "Middle East" describes an area slightly east of Europe. The "Orient" or "Far East" is east of Europe, whereas the "West" is Western Europe. "World History" taught in European schools frequently teaches only the history of Europe and the United States in detail, with only brief mention of events in Asia, Africa, and Latin America. Western accounts of the history of mathematics are often considered Eurocentric in that they do not acknowledge major contributions of mathematics from other regions of the world, such as Indian mathematics, Chinese mathematics, and Islamic mathematics. The invention of calculus is one such example. During the same period that European writers were claiming paradigmatic status for their own history, European scholars were also beginning to develop a knowledge of the histories and cultures of other peoples. In some cases the locally established histories were accepted, in other cases new models were developed, such as the "Aryan invasion theory" of the origin of Vedic culture in India, which has been criticized for having at one time been modeled in such a way as to support claims for European superiority. At the same time, the intellectual traditions of Eastern cultures were becoming more widely known in the West, mediated by figures such as Rabindranath Tagore. By the early twentieth century, some historians such as Arnold J. Toynbee were attempting to construct multi-focal models of world civilizations. At the same time, non-European historians were involved in complex engagements with European models of history as contrasted with their own traditions. Historical models centering on China, Japan, India, and other nations existed within those cultures, which to varying degrees maintained their own cultural traditions, though countries that were directly controlled by European powers were more affected by eurocentric models than were others. Thus Japan absorbed Western ideas while maintaining its own cultural identity, while India under British rule was subjected to a highly Anglocentric model of history and culture. Even in the nineteenth century anti-colonial movements had developed claims about national traditions and values that were set against those of Europe. In some cases, as with China, local cultural values and traditions were so powerful that Westernization did not overwhelm long-established Chinese attitudes to its own cultural centrality. In contrast, countries such as Australia defined their nationhood entirely in terms of an overseas extension of European history. Thus, Australia was, until recently, treated as having had no history or serious culture before colonization. The history of the native inhabitants was subsumed by the Western disciplines of ethnology and archaeology. Nationalist movements appropriated the history of native civilizations in South and Central America such as the Mayans and Incas to construct models of cultural identity that claimed a fusion between immigrant and native identity. Indian nationalism refers to the political and cultural expression of patriotism by peoples of India, of pride in the history and heritage of India, and visions for its future. It also refers to the consciousness and expression of religious and ethnic influences that help mold the national consciousness. Nationalism describes the many underlying forces that molded the Indian independence movement, and strongly continue to influence the politics of India, as well as being the heart of many contrasting ideologies that have caused ethnic and religious conflict in Indian society. It must be noted that in Indian English, there is no difference between patriotism and nationalism, both words being used interchangeably; nationalism, thus, does not have a negative connotation in India, as it does in much of Europe and North America. 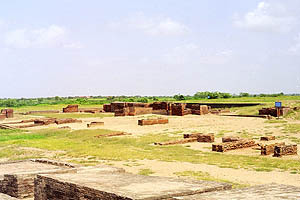 Archaeological site of Lothal. Dating back to 2400B.C.E. India is the home to Hinduism, the oldest religious practice in history. Indus Valley civilization, the third oldest civilization in recorded history and the most advanced civilization of its time is central to Indian nationalism. Ancient Indian town of Taxila was home to the Takshashila University, the world's oldest university. Ayurveda, the world's oldest science of medicine originated in India. Ancient India was the site of Mehrgarh, the oldest human village settlement in recorded history and the base of later Indian towns and cities. India is the birthplace of ancient languages like Harrappan. Predating the hieroglyphs in Egypt, these undeciphered inscriptions were written as far back as fourth millennium B.C.E. India is home to many Indo-European languages, the most prominent in India being Sanskrit. Sanskrit dates back to 3500 B.C.E. making it one of the oldest Indo-European languages. India is one of the cradles of mathematics, the Indian civilization is credited with mathematical inventions including zero, the decimal number system, algebra, trigonometry and calculus. Indians, such as Bhaskaracharya, calculated the time taken by the earth to orbit the sun hundreds of years before the astronomer Smart. According to his calculation, the time taken by the Earth to orbit the Sun was 365.258756484 days. The value of "pi" was first calculated by the Indian mathematician Baudhayana, and he explained the concept of what is known as the Pythagorean theorem. He discovered this in the eighth-seventh centuries B.C.E., long before the European mathematicians. The Rigveda of Hinduism was composed between roughly 1500–1300 B.C.E., making it one of the world's oldest religious texts. The very ancient practice of Yoga, which includes practices for spiritual enlightenment, martial traditions, exercise and conditioning, curing diseases and ailments, learning, and concentration originated in India. This practice is dated back to thousands of years according to the inscriptions found in the Indus Valley civilization. India is the birthplace of one the two major schools of religions in the world, the Dharmic religions, the other school being that of the Abrahamic religions. The Dharmic religions include Hinduism, Buddhism, Jainism and Sikhism. India is also the present home of the fourteenth and current Dalai Lama, his holiness Lama Tenzin Gyatso, the Buddhist equivalent of the Pope. India was the birthplace of the Buddhist monk Bodhidharma, credited for establishing martial traditions into the Shaolin temple of China and giving birth to the tradition of Chinese martial arts. The arts later spread to Japan, giving rise to many martial practices including Jujutsu and Judo. Japanocentrism is the ethnocentric belief that Japan is, or should be, at the center of the world. This may manifest itself domestically as the persecution and marginalization of non-Japanese, or globally as the pursuit of Japanese economic, cultural, or political hegemony. The first historical expressions of Japanocentrism may be found in the treatment of Ainu people, now to be found on Hokkaido island, whom the Japanese perceived as uncivilized and unable to use land productively. These attitudes, still somewhat common today, facilitated the gradual appropriation of Ainu farmlands and the relegation of Ainu to northerly areas. In many circles, Ainu are still viewed as "noble savages," best suited to a wild, foraging existence, in spite of the fact that Ainu have traditionally been a settled, agrarian people. Like most languages, Japanese has many terms to refer to outsiders and foreigners. Japanese, however, is remarkable for a rich lexicon of terms to "specifically" distinguish between Japanese and non-Japanese people and things. For example, the well-known term gaijin (外人), often translated as "foreigner," would be more accurately translated as "someone who is not Japanese, Chinese or Korean," since, unlike the English term, it is applied absolutely, not relatively. Japanese tourists in New York, for instance, might refer to New Yorkers, but never themselves, as gaijin. If a Japanese referred to himself as a gaijin, it would most likely be in an ironic sense. This is true of all words beginning with the kanji gai- (外), which literally means "outside." A more polite term, more common in modern discourse, is gaikokujin (外国人), which literally means "outside country person." Within Japan (and consequently, throughout the world), the study of the origin of the Japanese people and their language is often deeply entangled with Japanocentric and counter-Japanocentric ideas and assumptions, many of which are politically motivated. This has led to a climate in which new theories are often quickly labeled either "pro-Japanese" or "anti-Japanese." Many Japanese are reluctant to accept that their language could be related to another extant language, particularly that of a long-time rival. Hence, conjectures linking the Japanese and Korean languages, such as the Altaic theory, generally receive little exposure in Japan, and are often dismissed out of hand as anti-Japanese propaganda. Many are reluctant to accept that a close genetic relationship exists between Japanese and neighboring Asian peoples. Indeed, for some very conservative Japanese, the mere suggestion that the Japanese people originated on the Asian mainland is viewed as insulting. The animistic religion of Japan, Shintoism, involves the worshipping of the spirits found in every object and organism. Animals, houses, lakes, land, and even small toys and trinkets have a spirit, called Kami. It was at one point the primary religion of Japan, but since the Second World War, some of its practices have fallen out of use, or have changed their meaning or significance. The Japanese Emperor, the Tenno, was declared to be a divine descendant of Amaterasu, the sun-goddess who was the most widely worshipped in Japan. Because the Emperor was said to be the descendant of Amaterasu, the Emperor was said to be a Kami on Earth with divine providence. Thus, the Japanese valued their Imperial family, because they felt a connection to their Kami through the Tenno. After World War II, pressure from Western civilizations forced the Japanese emperor to renounce his divine status, proving a severe blow to Japanocentric ideals. The imperial family still remains deeply involved in Shinto ceremonies that unify Japan. Shinto itself does not require declaration or enforcement to be part of the religion, so there are still many who believe the renouncement of divine status by the Tenno was a mere political move, keeping Shinto ideals intact in the Imperial family. Its prosperous but turbulent economy, along with the pressures of globalization and a low birth rate, have made Japan increasingly dependent on foreign workers and international cooperation. Its corporate culture, which has long favored protectionism, job security, and close cooperation with government, has strained to adjust to unfamiliar conditions. A central focus of Japan's corporate culture has traditionally been the preservation of Japanese culture, by such means as strict immigration controls. An influx of Korean and Taiwanese nationals into the workforce, though necessary to remedy the labor shortage, has met with major resistance at all levels of society. The presence of these so-called sangokujin (三国人; "third country nationals") has been characterized as a disproportionate source of criminal activity. Foreign laborers, particularly the Korean Zainichi, are regularly accused of disloyalty and even sedition. The belief that Japan has a central role to play in world politics, whether as a bulwark against Western hegemony or as a force in its own right, remains a central issue in Japanese politics, particularly for right-wing nationalists. The rise of the People's Republic of China as a global power has only intensified many of these feelings, as many Japanese now view their country as a check on Chinese power in the region. The "Sinocentric World": The area of usage of Chinese characters at its maximum extent (to a considerable extent following the borders of the Qing dynasty). Areas using only Chinese characters in green; in conjunction with other scripts, dark green; maximum extent of historic usage, light green. Sinocentrism is any ethnocentric perspective that regards China to be central or unique relative to other countries. In pre-modern times, this took the form of viewing China as the only civilization in the world, and foreign nations or ethnic groups as "barbarians." In modern times, this can take the form of according China significance or supremacy at the cost of other nations in the world. The Sinocentric system was a hierarchical system of international relations that prevailed in East Asia before the adoption of the Westphalian system in modern times. At the center of the system stood China, ruled by the dynasty that had gained the "Mandate of Heaven." This "Celestial Empire" (神州 shénzhōu), distinguished by its Confucian codes of morality and propriety, regarded itself as the only civilization in the world; the Emperor of China (huangdi) was regarded as the only legitimate Emperor of the entire world (lands "all under heaven" or 天下 tianxia). Identification of the heartland and the legitimacy of dynastic succession were both [essential aspects of the system. Originally the center was synonymous with the Central Plain, an area that was expanded through invasion and conquest over many centuries. Outside the center were several concentric circles. Local ethnic minorities were not regarded as "foreign countries" but were governed by their own leaders (土司 tusi), subject to recognition by the Emperor, and were exempt from the Chinese bureaucratic system. Outside this circle were the tributary states which offered tribute (朝貢) to the Chinese Emperor and over which China exercised suzerainty. The system was complicated by the fact that some tributary states had their own tributaries. Beyond the circle of tributary states were countries in a trading relationship with China. The Portuguese, for instance, were allowed to trade with China from leased territory in Macau but never entered the tributary system. Under this scheme of international relations, only China had an Emperor or Huangdi (皇帝), who was the "Son of Heaven;" other countries only had Kings or Wang (王). The Japanese use of the term Emperor or tennō (天皇) for the ruler of Japan was a subversion of this principle. While Sinocentrism tends to be identified as a politically inspired system of international relations, in fact it possessed an important economic aspect. The Sinocentric tribute and trade system provided Northeast and Southeast Asia with a political and economic framework for international trade. Under the tribute-trade system, articles of tribute (貢物) were presented to the Chinese emperor. In exchange, the emperor presented the tributary missions with return bestowals (回賜). Special licenses were issued to merchants accompanying these missions to carry out trade. Trade was also permitted at land frontiers and specified ports. This sinocentric trade zone was based on the use of silver as a currency, with prices set by reference to Chinese prices. The political aspect of this system is that countries wishing to trade with China were required to submit to a suzerain-vassal relationship with the Chinese sovereign. After investiture (冊封) of the ruler, the emperor permitted missions to China to pay tribute. The Sinocentric model was not seriously challenged until contact with the European powers in the eighteenth and nineteenth centuries, in particular the Opium War. This was mainly due to the fact that China did not come into direct contact with any of the major empires of the pre-modern period. For example, trade and diplomatic contact with the Roman Empire, and later, the Eastern Roman Empire, was usually via proxies in the form of Persians. The Sinocentric model of political relations came to an end in the nineteenth century, when China was overwhelmed militarily by European nations. The ideology suffered a further blow when Japan, having undergone the Meiji Restoration, defeated China in the First Sino-Japanese War. As a result, China adopted the Westphalian system of equal independent states. While China has renounced claims to superiority over other nations, some argue that China never really completely abandoned Sinocentrism and that a Sinocentric view of history lies behind many modern Chinese constructs of history and self-identity. Critics of this theory allege that "Sinocentrism" is a poorly construed portrayal of China designed to incite anti-Chinese sentiment. According to this view, China has been generally peaceful throughout its history: with rare exceptions, China is said never to have made any forceful attempts to invade or colonize other nations. China's territorial expansion is attributed to ethnic groups such as the Mongols and Manchus, not the Han Chinese. Additionally, China is said not to have forced other civilizations to conform to its standards. Many of its neighbors—Korea and Japan included—willingly emulated China during these ancient times because they recognized elements of Chinese civilization as being of value. Doubts have also been expressed about the use of "Sinocentrism" as a catch-all term for explaining China's interactions with the rest of the world. Subjective mentalities explain less than the realities of the Chinese strategic situation, in particular its need to control and defend its frontiers and deal with surrounding territories. What some have regarded as a sense of cultural and moral superiority was often merely an attempt to limit and control contact between foreigners and Chinese. For instance, the Qing Emperors tended to mistrust the loyalty of their Chinese subjects, and their exclusionary policy against the Europeans was probably motivated by fear that the latter might cause problems among their subjects. Ethnocentrism is a lens through which people examine other cultures. A person may compare the morals, ethics, history, and religion of another country to their own, and decide that their own nation's practices are superior. This is the formation of an ethnocentric thought process. The opposite to this idea is "cultural relativism," the idea of viewing another culture with no preconceived notions or judgments. Ethnocentrism establishes the ideas of a "proper" living, and that these other countries in comparison do not measure up to the "proper" way of living. Ethnocentrism can be seen as the backbone of stereotypes. Ideas such as the work ethic of a particular culture, or lack of morals in another culture, stem from the idea in ethnocentrism that one's own culture is above a foreign culture in many regards. The scope of ethnocentrism can also be held responsible for instigating racism in different societies. Ethnocentric perspectives are not merely limited to different nations, indeed different races in the same society often look at other races from an ethnocentric point of view. The evolution of globalization can lead to a decrease in ethnocentric evaluations. With the world becoming more connected, and with people having greater access to information than at any other time, it is possible to dispel many cultural myths in coming generations, fostering a better universal understanding of how different cultures function and maintain themselves. Indeed, ethnocentrism is not a problem that needs to be around forever. Group Processes and Intergroup Relations. Sage Press. Turner, Frederick Jackson. 1999. The Significance of the Frontier in American History, in Does The Frontier Experience Make America Exceptional?. This page was last modified on 14 August 2017, at 16:12.